When you take your kitten home it may feel quite lost and alone after being with mother and litter-mates. It is natural for it to stand and meow as it is calling for mother and friends. It may be cautious and hide until it feels secure. Generally with special loving attention and gentle handling it will adapt quickly. It may be reluctant to eat at first because it misses the company of its brothers and sisters around the plate. For sleeping it may prefer your bed and your company! If this is not what you want, make it comfortable in a cozy chair or cardboard carton lined with something soft or even newspaper. Be sure that it doesn’t have to look far for its litter pan. A kitten is like a young toddler. It cannot control the urge for a long period while it runs from the second floor all the way to the basement! Provide a close alternative so that it will not choose the nearest available corner. Cats are fussy and will often not use a dirty or smelly litter pan. If you are not regular in your clean-up chores do not be surprised if your kitten has unwelcome accidents. 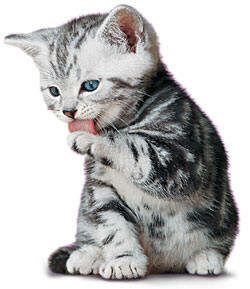 At first your kitten will need three or four small feedings daily depending on its age and size. By four months most kittens can eat enough for their needs at two meals each day. A good quality canned food is your best choice, adding some dry chow to its diet as well. An average kitten or cat requires four to six ounces of canned food per day with about a quarter cup of dry chow, although some large or stockier breeds will require more. It is best to ask your breeder for diet suggestions. Occasional a small amount of liver, kidney and raw meat are often a nice change, but more than a few ounces of liver each week can be undesirable. The kitten can have cooked egg or raw egg yolk, but never raw egg white. Water is needed at all times. Milk may cause diarrhea or digestive upsets, particularly in Siamese cats. Many cats thrive on cottage cheese added to their basic food. While the kitten is growing a vitamin supplement is a good idea. Adapting to a new environment can be stressful and it is not unusual for a kitten to come down with minor sniffles and sneezes because the stress has lowered its natural resistance to common germs. If your kitten becomes sick during the first few days in his new home, it is best to contact the breeder for advise and assistance in treating the problem. An apparently healthy kitten could have been incubating an infection just before you brought him home. Ethical breeders will take the kitten back for treatment or have their own vet check the kitten and prescribe treatment. If you do not contact the breeder in such a case, you cannot expect him to pay the bills you incur. If you are working each day you should consider having two kittens together so that they will not be so lonely during the day. The second kitten need not be another purebred, if your budget won’t stretch that far. You may find an appealing mixed breed kitten or young cat at the S.P.C.A. For more complete and up to date information about cats, may we recommend the excellent book entitled “The Book of the Cat’, published by Summit Books, available in local bookstores as a large format paperback. Article supplied by: Information provided by the members of the Southern Alberta Calgary Cat Fanciers.